Do you want long and healthy hair? I think your answer should be yes! Hair is the main accessory for the women and it plays a significant role to a person’s appearance. Therefore, it is very important to give more attention as well as good care of them. Hence, today in this article we are helping you by providing very important hair growth tips. Every women or girl wish for smooth and strong hairs but they do not know the method for hair growth. You should know that how to make your hair grow faster and longer. Many people’s faces hair problems due to their bad eating habits as well as the pollution present in the environment. There are many hair issues like hair fall, dandruff, breakage and fragmented ends etc. All hair grows an average of ½ inch per month but it fully depends upon you that how you care for your hair. Most of the women are taking vitamin pills other are in myth that if they cut their hair in the full moon then their hair will grow fast and also long. One thing you required that your promise to healthy hair practices as well as treating your hair with TLC. Now, we are giving a list of the tips and tricks which is very helpful for the healthy and long hair. 1. Brush your hair: It is very important to brush your hair every day for 1 or 2 minutes. That means not only in morning but also in the evening. It is very beneficial to revive circulation in your scalp. One thing you should remember that when you brush your hair in a wet condition then there is chances of breakage and damaging your lock. There is no necessity to brush your hair 100 strokes per night earlier going to sleep. Only gentle massage is required for your hairs. 2. Don’t wash your hairs daily: If you wash the hairs daily then it damages the scalp and pulls the elements. Apply oil into hairs to give strength rather than washing. One thing you should remember that only wash your hair for at least 2 to 3 times in a week. And then you will see receiving them shiner and flatter. 3. Condition: This is vital for having healthy hair. Moreover the right shampoo and conditioner, use leave-in conditioners as well. Conditioning is required once in a month for a good hair growth. Well-moisturized hair solves the problem of dryness and ruptures that are important to more hair retention as well as smooth your hair and make it look beautiful. Deep conditioning is very helpful to return the lost moisture to your hair and makes the cuticles lay flat. If you want long hair then use excellent condition between the trims. Some conditioner contains silicons as well as waxes which is very useful to prevent the skin on your head from breathing and block the pores. This is nothing but a home remedy which is very great and well-organized hair mask. This hair mask is very beneficial to help your hair grow faster as well as makes your hairs healthy, beautiful and shining. Add 1 egg yolk, 1 table spoon of extra virgin olive oil, 1 teaspoon of honey then massage this mixture into the roots of your hair with spreading along with the length. Leave this for about 40 minutes. You can also make a covering on your head by towel or by other thing. Afterward wash your hair and condition them as usual, you will get the better results. 5. Healthy lifestyle: A healthy lifestyle is very essential to have strong, thick and wonderful hair. Include more proteins in your diet. Food plays a very significant role in growing your hairs. Protein delivers a structure material for your locks to grow faster, look improved and be stronger. You have to care your body from inside also. There is need to involve fresh fruits, green vegetables, eggs milk, and meat and drink enough water for getting a good hair and your hair produces directly from your body. Iron to reduce detaching: Red meat, fish, and fowl etc. Biotin (B7) for hair growth, power, and breaking prevention: Eggs with yolk, halibut, nuts, and lentils etc. Omega 3 foods: avocado, Salmon, and walnuts etc. Antioxidants, selenium and zinc for hair overhaul and strength: shellfish, Oysters, and legumes etc. 7. 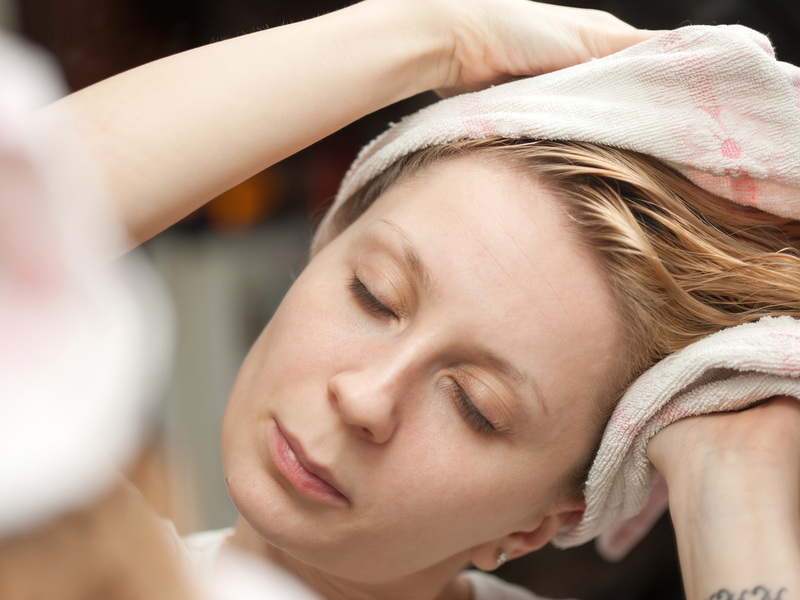 Massage your scalp: Massage is very necessary every time when you shampoo your hair. Use your fingers for massaging the skin around your head, for about 20 minute push and also move in circular motion. It is responsible for the increase of blood circulation which advances the skin with vital oxygen as well as nutrients. Hot oil Massaging plays an important role in strengthening the roots and makes us relax. This method is very beneficial for giving strength as well as nourishment to the skin. The process of massaging is repeated at least twice or thrice a week. There are many examples such as Olive oil, jojoba oil, linen oil, argon oil, etc. one thing you note that never boil the oil only slightly warm it up. You will get shiny and healthy hairs. 8. Always trim your hair: The methods of trimming means cut the splits of your hair are very important. This process is always good and patience. If you left your hair without trimming then there may be chances of hair breakdown. As a result of trimming your hairs will grow faster. Trim your hair at least half inch in every month. Only good tool is used for trimming your hairs or do not use anything else. Definitely you will see the result. 9. Reduce stress: Stress is also a chief reason for hair fall as well as not good for overall health. Stress is responsible for weakening and slows down your growth of hairs. Do exercises like taking long breath, yoga and meditation during the stress. When you reduce the stress then you will see the growth in your hair. 10. Use Moisturizing Products: Moisturizing the hair is very necessary for the growth of the hairs. Because gloomy hair is frequently dry by nature, so it is best to use products that swap wanted moisture. This contains by conditioners as well as shampoos expressed for dry and/or injured hair. These products don’t have to come strictly from the “ethnic” hair passage, whichever many mainstream brands make hair products for different types of hair, from oily to dry. 11. Stay Away from Heat: It is very essential to protect you against elements damage. If you care for your hair then then you find long and happy life span of your hair. Whereas occasional curling iron and flat iron is normally good. You should have to minimize heat fashioning as much as possible. Use only gentle styling systems do not depend upon different styling that includes heating. I think most of women’s as well as men uses this .Henna is used for periods by women in order to appreciate naturally thick hair. Mix natural henna powder with an egg and half a cup of lemon juice with the water. Create a paste and apply the paste over your scalp and your hair, starting from the root to the tips. Leave it for about 2 hours and let it for complete dry. After that wash and shampoo. 13. Use only cold water: It is most important that wash your hairs with the cold water as you can stand. This is very beneficial for your hair cuticles lay flat also there is less chances of disruption as well falling. Use shower which is very good method for washing the hairs and also essential for hair growth. 14. Wear Gentle Styles: Do not apply different types of hairstyles which involve jerk and put stress on your hair as well as on scalp. The different hairstyles such as tiny braids, tightly-pulled ponytail or hair extensions are responsible to hair fall. Today there is a fashion in men to keep ponytail. If you twitch your hair tightly, there is a stress made on same roots day after day, and as a result damage to hair and hair fall occurs. Therefore choose only those styles which are of breakable nature. Hairstyling should never be painful but try to avoid doing regularly. 15. Comb is required: Use only a wide toothed comb for your hairs. When you use the comb then the hairs get exercised and the roots becomes stronger and the growth is also very well. Do this in slow motion. So, these are the hair growth tips. I hope you have enjoyed this and find this article very beneficial and informative.